When Andrew and I set our goal to explore New Brunswick from corner to corner, one of the destinations at the top of my list was the Acadian Peninsula. Other than a few camping trips to Kouchibouguac National Park, I hadn’t spent much time on New Brunswick’s Acadian Coast growing up, so I was eager to discover this distinctly different region of my home province. Where is the Acadian Peninsula and Acadian Coast? 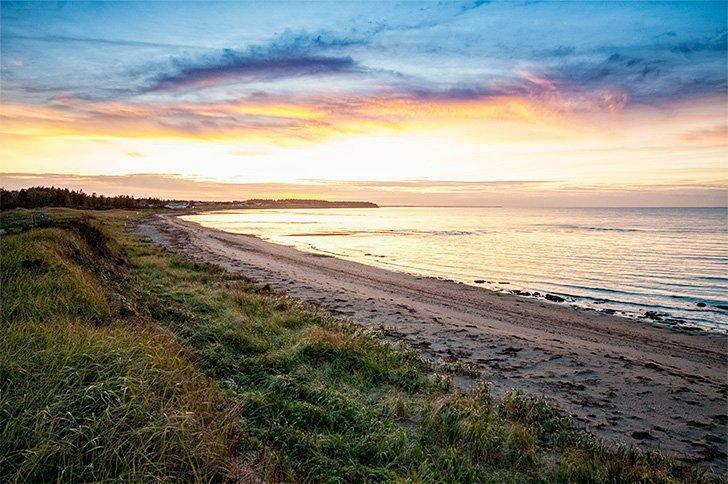 When is the best time to visit the Acadian Coast? 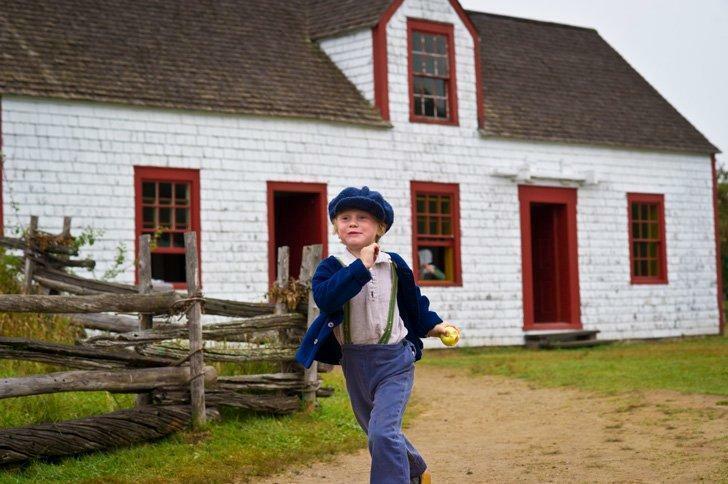 Discover Acadian culture on the northeastern shores of New Brunswick. New Brunswick’s Acadian Coast is the eastern shore of the province that borders Nova Scotia and links to Prince Edward Island. The area is primarily francophone and has a proud Acadian heritage. The Acadian Peninsula is the northeast corner of New Brunswick that juts out into the Gulf of St. Lawrence. The northern half of the peninsula is separated from Quebec’s Gaspé Peninsula by the Bay of Chaleur. The Acadian Peninsula also includes two large islands, Lamèque and Miscou, connected to the mainland by bridges. The Acadian Peninsula’s shape provides a perfect circular route for a road trip. You can begin and end your trip in Miramichi (be sure to read our article on things to do in Miramichi) or, as we did, continue south down the coast to complete the Acadian Coastal Drive, one of New Brunswick’s scenic driving routes. One word of warning: New Brunswick’s roads aren’t always in the best of shape. We drove the entire Acadian Coastal Route and found some sections of pavement to be in poor repair. On the upside, it forces you to slow down and enjoy the scenery, but your car’s shocks may suffer for it. We’d recommend at least three days to discover the Acadian Peninsula and a full week to be able to enjoy everything the Acadian Coastal Route has to offer. The more time you have, the better! 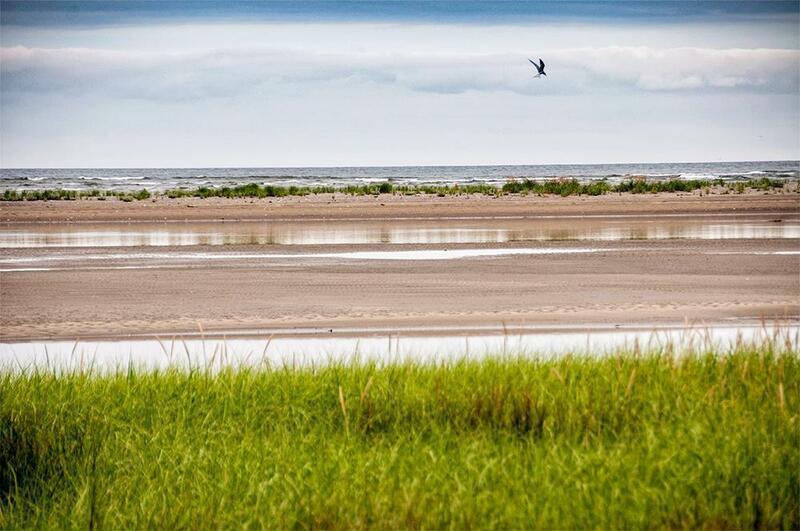 Enjoy the white sandy beaches of the Acadian Coast. 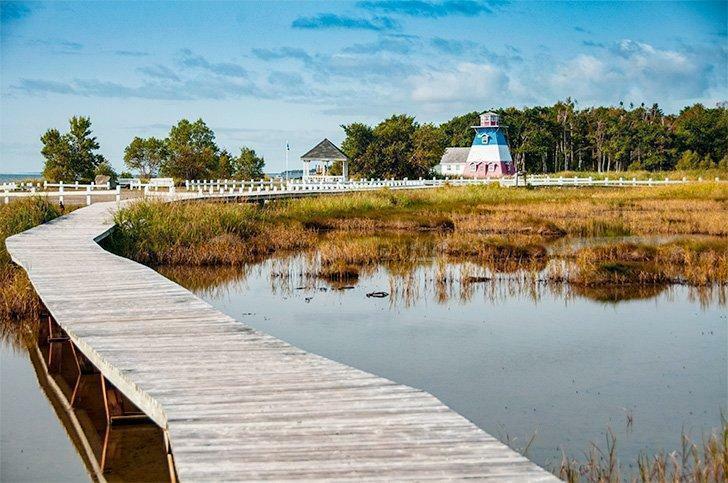 The Acadian Coast has plenty to offer visitors year round, depending on your interests. If you want to take full advantage of the beautiful beaches and warm salt water, summer is ideal. Of course, this is also the busiest tourist season. To avoid the crowds, we love visiting during the shoulder season in spring or fall. Take note though, the majority of tourist attractions only operate from late spring until early autumn. Be sure to check the open dates of the attractions you want to visit if you’re planning an off-season trip. 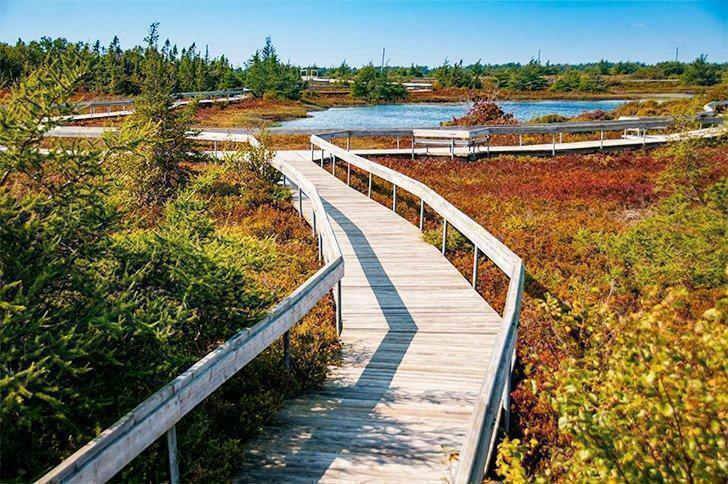 For stunning fall colour, an autumn visit to the peat bogs on the islands is a must. Or, if you love the snow, there are plenty of winter activities from snowmobiling to winter camping at Kouchibouguac to keep you entertained. If you only do one thing on the Acadian Coast, make it Kouchibouguac. This beautiful national park has everything from pristine sandy beaches to dense forest and everything in between. There is excellent canoeing, hiking trails for all fitness levels, and plenty of wildlife to observe. Read our 8 reasons to visit Kouchibouguac for more inspiration. 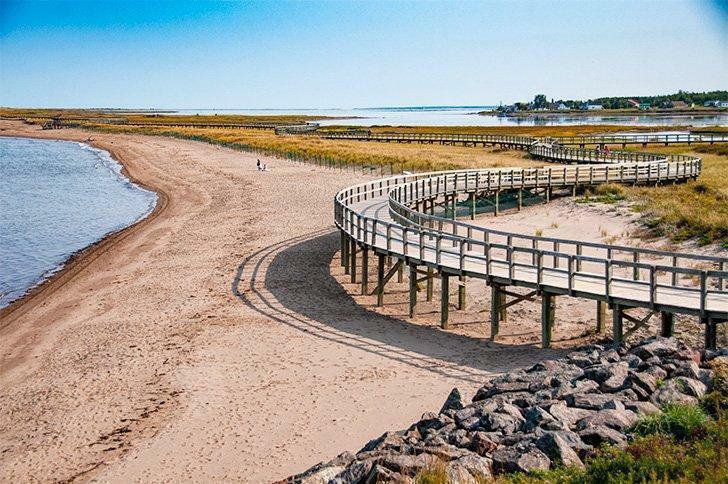 Go for a meandering stroll on the Dune de Bouctouche. Growing up on New Brunswick rocky, rugged Fundy coast, I’m always amazed by the vast sandy shores of the Acadian coast. Nowhere is this more apparent than the Dune de Bouctouche. The Irving Eco-Centre was set up by J.D. 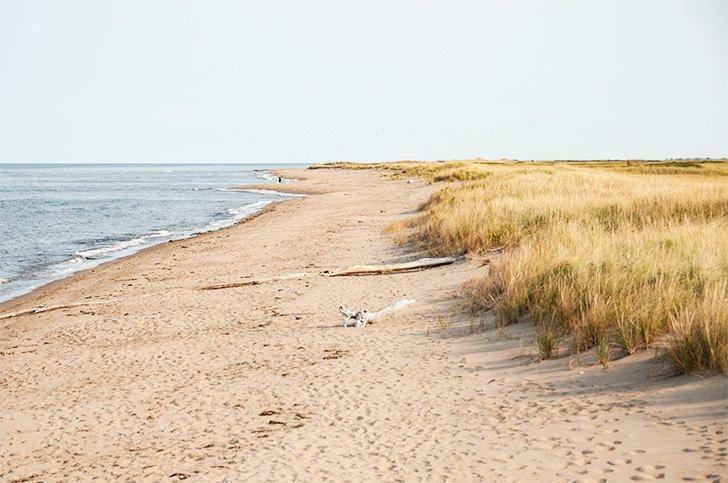 Irving Ltd. to protect the ecosystem here; one of the last great dunes of the northeastern coast of North America. The dune is estimated to be more than 2000 years old, and it changes shape with each tide and storm, as evidenced by the frequent repairs needed to the vast boardwalk. 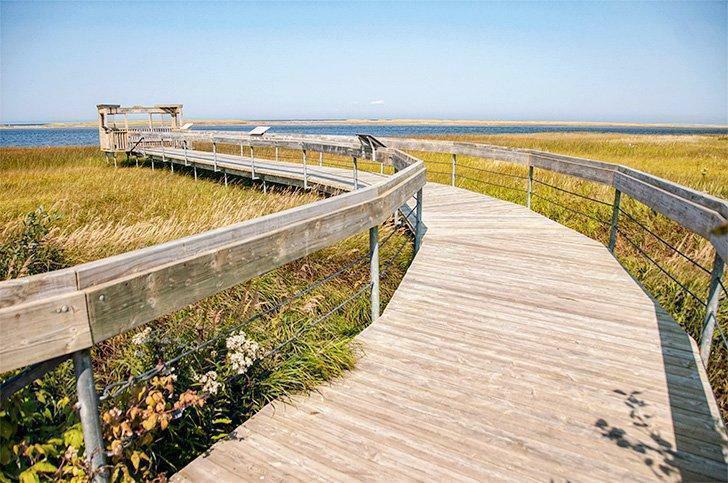 Learn about the dune and the wildlife that calls it home in the Eco-Centre and the stroll the meandering boardwalk. Take a picnic and enjoy it on the beach while watching the waves roll over the white sand. Visit the peaceful chapel at the Irving Arboretum. Bouctouche is also home to the Irving Arboretum, donated to the city by one of the province’s oldest industrialist families. This tranquil green-space is filled with walking and biking trails. There are formal gardens and plenty of peaceful corners to enjoy. Stop at the chapel to learn about the Irving family from the volunteer guides or just to enjoy a moment of quiet contemplation. Discover the bird life at Ile-Aux-Foins Park. Ile-Aux-Foins Park in Neguac is a real hidden gem. The park is an island connected to the mainland by a causeway and is a haven for seabirds. Half of the island is wooded while half is marshy and the entire park is crisscrossed with trails and boardwalks. 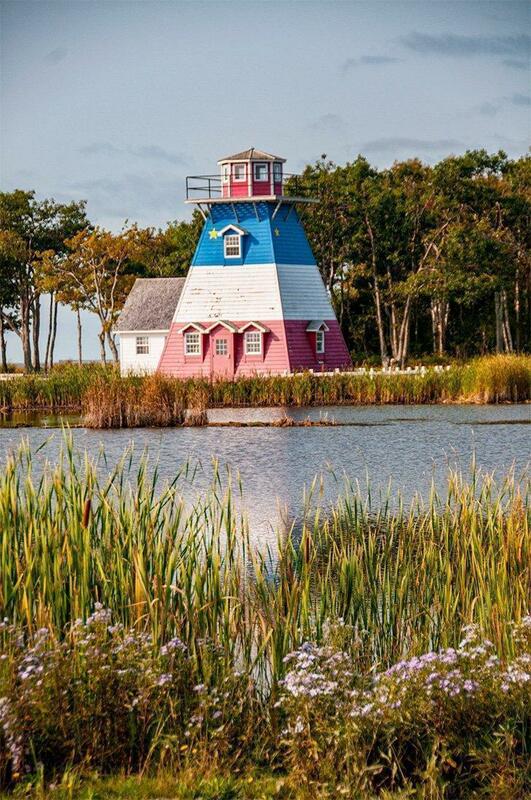 There’s a small lighthouse painted the colours of the Acadian flag, sandy beaches, a children’s play area, and plenty of picnic tables and bird observation areas. Get a bird’s-eye-view from the top of the Miscou Island Lighthouse. Miscou is a nature lover’s paradise, and you could easily spend your entire holiday exploring the trails and beaches of the island. Drive all the way to the end of the island to visit the lighthouse. Climb to the top for an incredible view of the surrounding landscape. The day we visited there were dozens of seals just offshore. Near the lighthouse is a short boardwalk overlooking Lake Frye. The lake is a haven for birds, and an interpretive panel shows the numerous species you can spot from the look-off platform. Go bird watching at Lake Frye on Miscou Island. One of Miscou’s primary industries is peat. You can discover one of the peat bogs by following the boardwalk trail just off the main road. Interpretive panels tell the story of the peat bogs and uncover the flora and fauna found in them. The bogs are stunning in autumn when they turn a vibrant shade of red. Discover the colourful peat bogs of Miscou Island. Don’t miss the epic sunsets at Murray Beach Provincial Park. One of our goals since we’ve been back in Canada is to stay in all of New Brunswick’s Provincial Parks. Our time in Murray Beach was a highlight of this quest. Located at the southern tip of the Acadian Coastal Route, not far from the Confederation Bridge to PEI, this small park is a quiet oasis. We arrived for a week at the tail end of the season and had the park almost entirely to ourselves. Because our motorhome is outfitted with solar panels, we were able to camp off-grid, right down beside the beach where we witnessed some genuinely epic sunsets. This small park doesn’t offer a lot in the way of activities, but if you’re looking for beautiful views in an out-of-the-way setting, it’s well worth a visit. 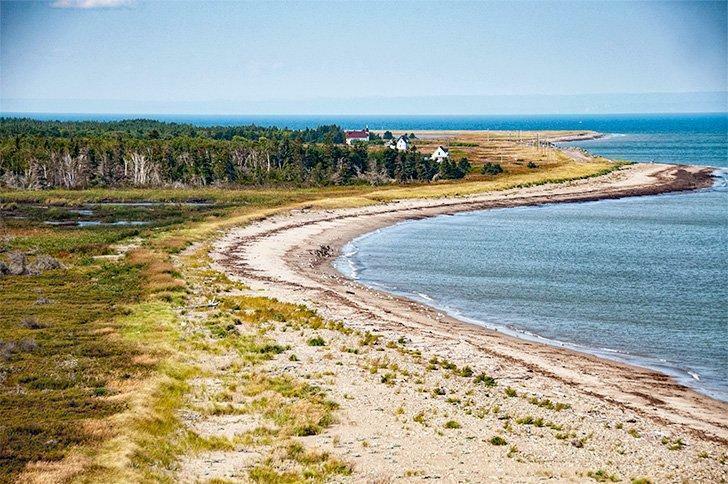 If you take the very last New Brunswick exit before crossing the bridge to PEI, you’ll find yourself at the Cape Jourmain National Wildlife Area. This 621-hectare conservation area offers visitors three hiking trails to choose from across ten unique ecosystems. 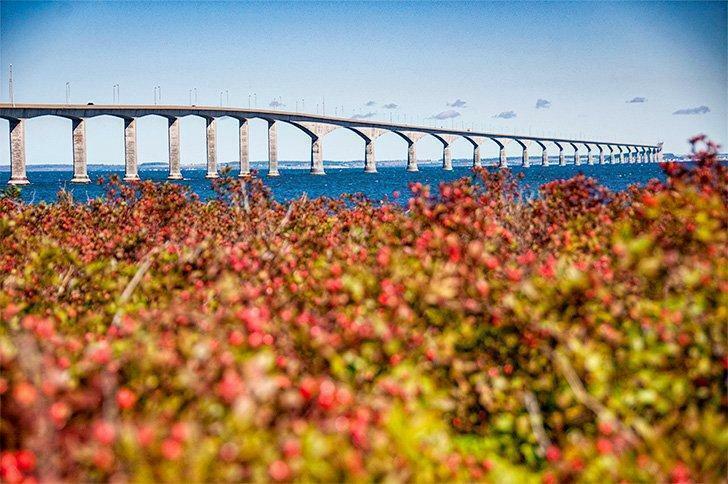 There’s plenty of bird and animal life to discover along the way, as well as spectacular views of the Confederation Bridge. Hike to the lighthouse or climb the observation tower for sweeping views of the coast. The New Brunswick Aquarium in Shippagan is a destination for all ages. It is home to more tanks than any other aquarium in Atlantic Canada and more than 100 species of fresh and saltwater fish. Exhibits teach about the local fishery and focus on sustainable practices. 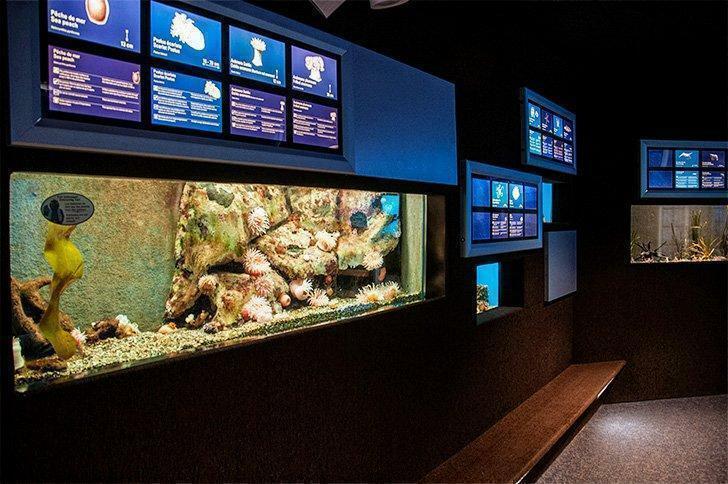 There’s a huge touch tank where you can get up close and personal with starfish and lobsters. However, the stars of the Aquarium are the playful seals. There’s also a restaurant and gift shop onsite and don’t miss a photo op at the lighthouse! 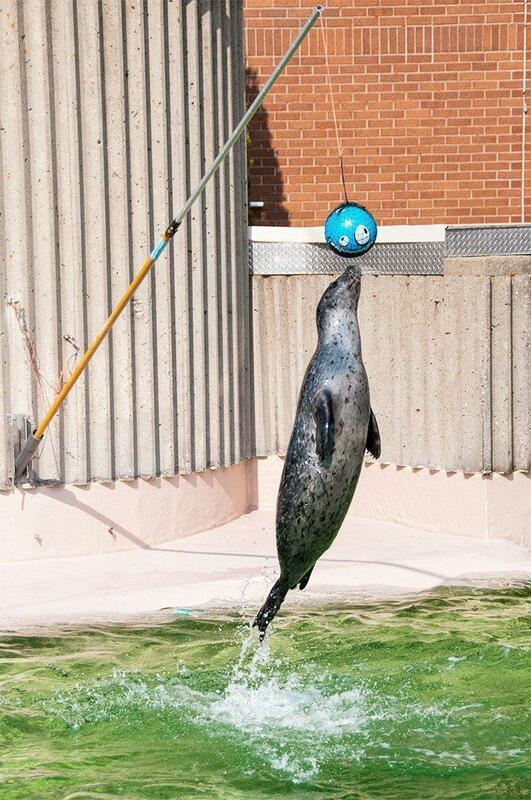 Don’t miss the playful seals at the aquarium. To learn more about who the Acadians are and where they came from, don’t miss a visit to the Village Historique Acadian. 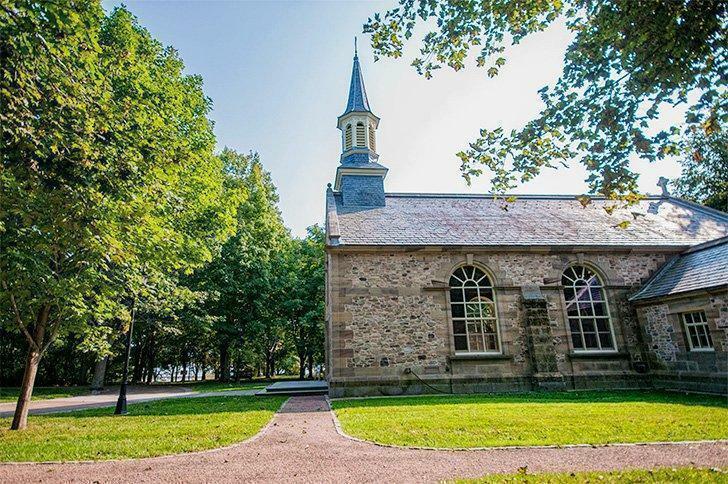 This open-air museum showcases the lives of the early Acadian settlers who started their lives over here after Le Grand Dérangement (or great deportation). The more than 40 historical buildings date from 1770 to 1949 and are animated by costumed interpreters. Visit the school or general store. 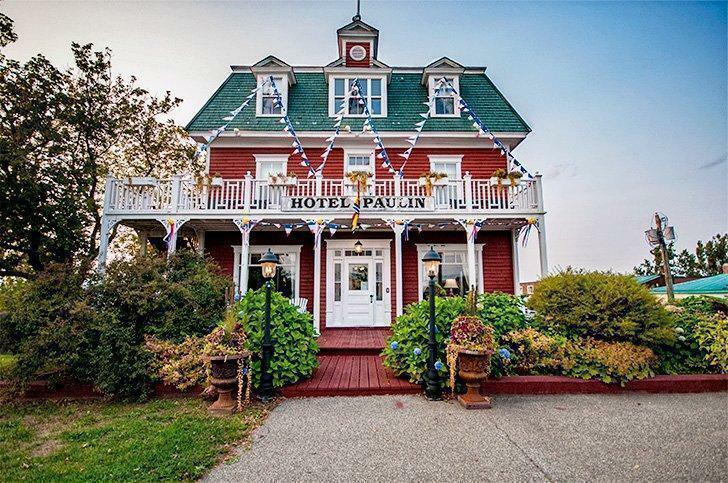 Have a traditional Acadian meal at the restaurant or even spend the night at the Hotel Chateau Albert. 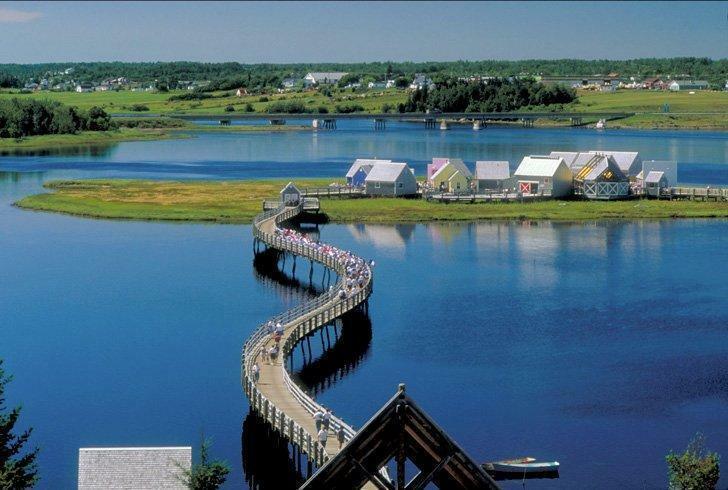 La Pays de la Sagouine is a reproduction Acadian fishing village from the prohibition era on an island in Bouctouche. Here you can take part in a rollicking musical dinner theatre, that is part kitchen party and part historical enactment. You’ll hear authentic stories and songs while learning about Acadian culture and enjoying a traditional meal. If you don’t already know New Brunswick has some of the best lobster in the world, where the heck have you been? While Shediac is the most famous town on the Acadian Coast for lobster suppers, you can find this delicious crustacean in various forms at restaurants up and down the coast. If you ask us, the best way to enjoy lobster is to pick up a few from a local lobster pound and cook them yourself (in salt water only please!). Add a dish of melted butter with a splash of vinegar for dipping and prepare to get your hands dirty. If you’re not up to tackling a whole lobster, the next best thing is a delicious lobster roll. 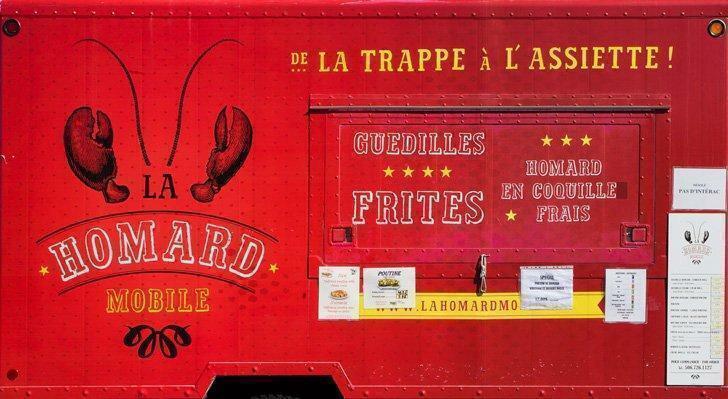 Grab one of the best from La Homard Mobile, a lobster food truck, based in Caraquet. 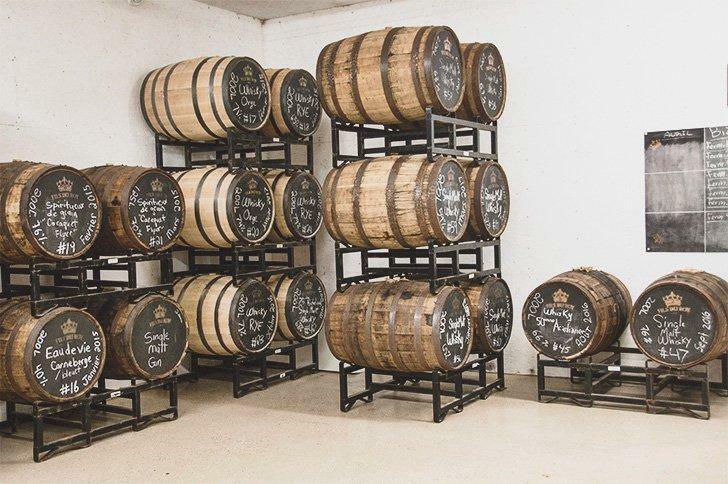 Peek behind the scenes at Distillerie Fils du Roy. Andrew and I got caught up in the gin and tonic craze in our final years in Brussels. When I heard there was a gin produced in New Brunswick, I was eager to give it a try. Gin Thuya by Distillerie Fils du Roy quickly became my new favourite beverage, and I wasn’t alone. It has won gold medals at spirits competitions from San Francisco to London. The distillery also produces rum, absinthe, whisky, and several fruit-based spirits, many of which use local products. You can tour the facility in Petit-Paquetville and enjoy a cocktail in the tasting room. If you have the opportunity to chat with the distiller, Sébastien Roy, you’ll be entranced by his passion for his work. Much like Sébastien Roy, Didier Laurent of Fromagerie Au Fond du Bois is passionate about his work. 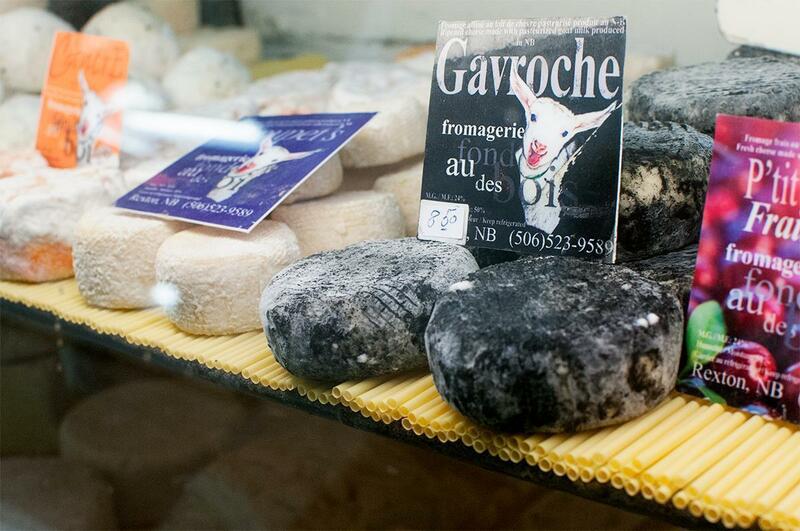 He and his herd of friendly goats produce the best cheese we’ve had in New Brunswick. And, despite the hardship of losing almost all of his production in 2016 to an ice storm, he perseveres. While you can find his delicious products at farmers markets around the province, if you have the opportunity to visit his farm and taste the cheeses onsite, you definitely should. Nothing goes better with delicious cheeses than a great bottle of wine. 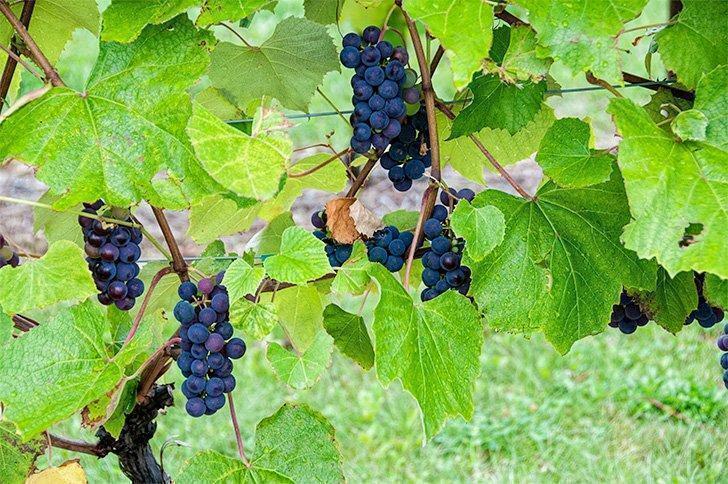 Luckily, not far from the fromagerie, you’ll find Richibucto River Wine Estate. We’ve tried a lot of Atlantic Canadian wines since our return and found most of them to be too sweet for our palates. However, we fell hard for Richibucto River’s Carmine, a dry red blend of Frontenac and Marechal Foch grapes. You can visit the tasting room and ask for a tour of the vineyard to learn about the many wines produced here. Indulge in Maison Beau Soleil oysters from New Brunswick. New Brunswick may be famous for lobster, but we’re no slouches when it comes to other seafood either. 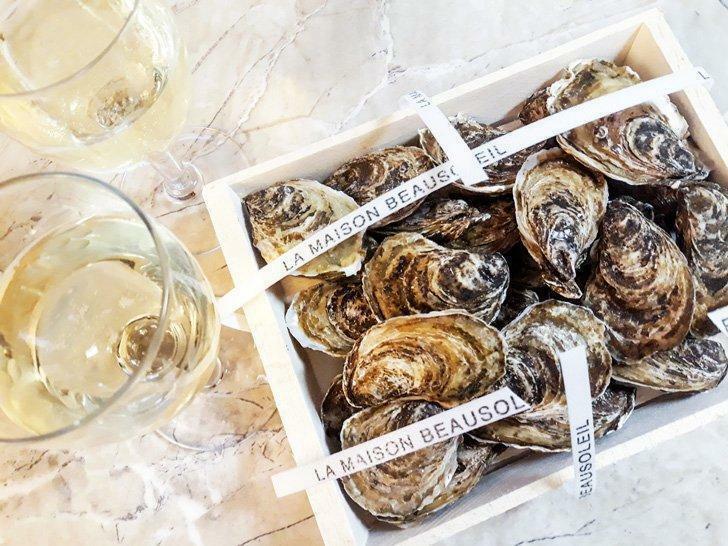 More recently, the province has been recognised around the world for oysters, specifically Maison Beau Soleil oysters. These delicious little shellfish are smaller than most oysters but packed with flavour. They are sweet, salty, and have almost a nutty finish. In short, they’re delicious. 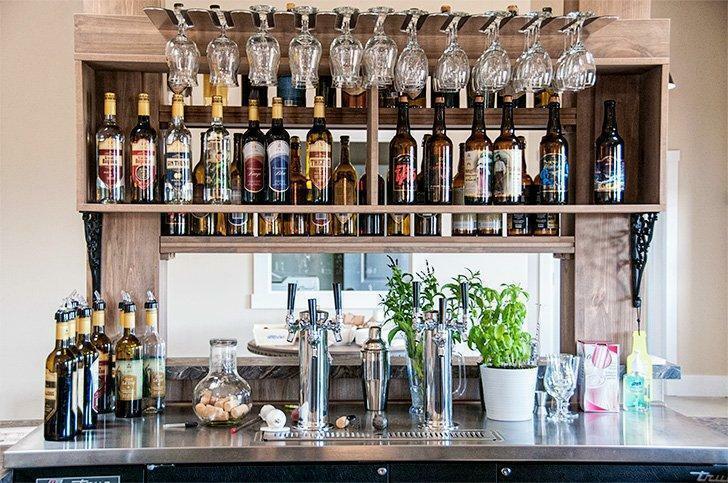 While you can eat pizza pretty much anywhere in the world, the speciality at Pizza 5 Etoiles in Saint Louis de Kent is a taste of New Brunswick. The decadent seafood pizza is loaded with whole scallops and lobster meat in a creamy sauce, covered in cheese. It is rich, heavy, and mouth-wateringly delicious. I will admit, I was sceptical when our B&B host recommended a sushi restaurant in Caraquet as sushi in the bigger cities in New Brunswick can be hit or miss. I needn’t have worried. Mitchan Sushi was authentic and delicious, highlighting the incredible Acadian seafood from the region. 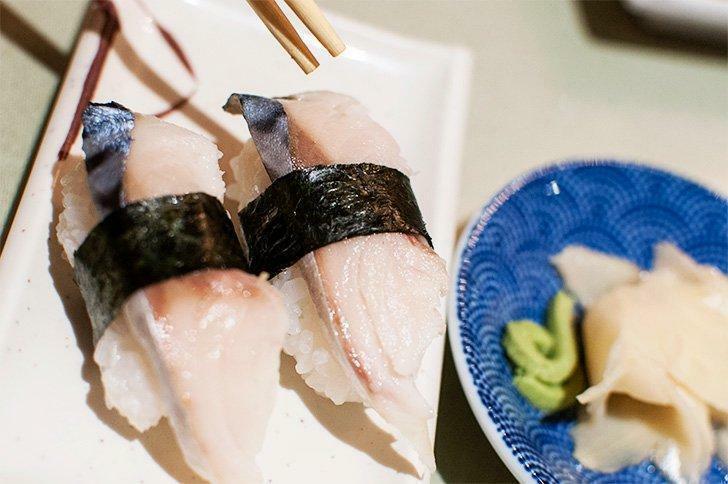 If you’re looking for a different way to experience the best of New Brunswick’s products from the sea, reserve your table for an incredible Japanese-Canadian experience. 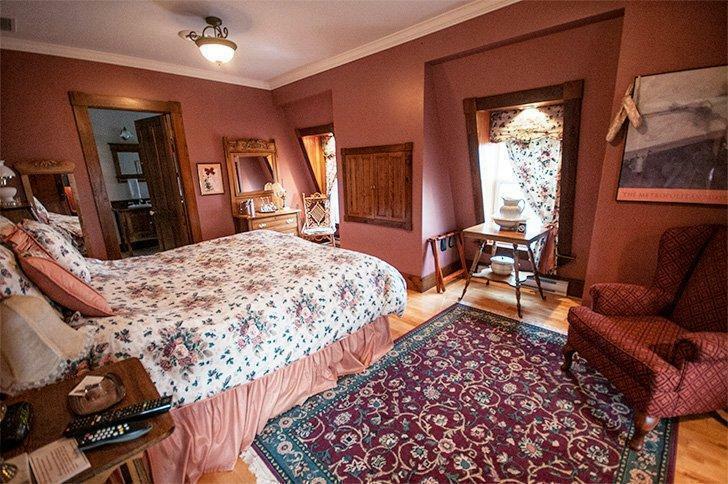 The charming Le Poirier B&B in Caraquet, NB. 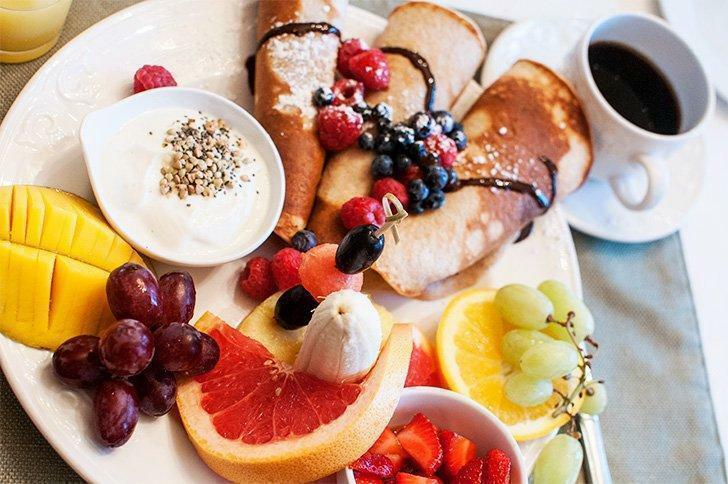 Wear your stretchy pants for Le Poirier B&B’s epic breakfast! Discover the Old World charm of the Hotel Paulin, in Caraquet. Built in 1891, the Hotel Paulin has been in the same family since its beginnings. 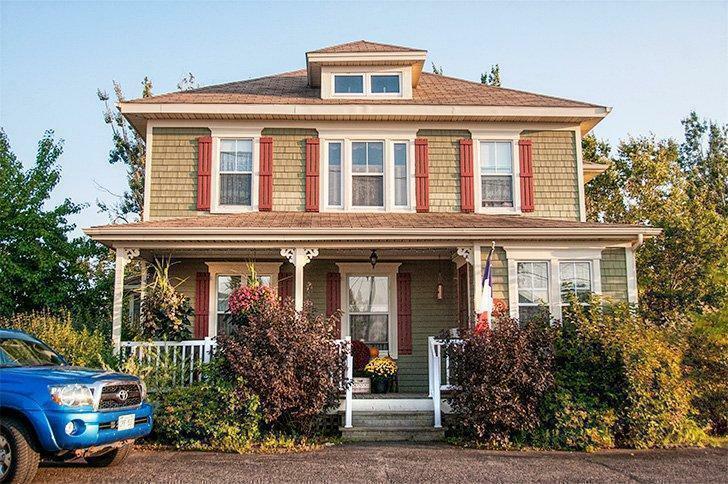 A stay here provides a taste of old-world charm and hospitality, in the heart of Caraquet. Treat yourself to 5-star luxury in the top floor suites! Don’t miss the opportunity to dine in the restaurant where Chef Karen Mersereau will wow you with a refined table d’hote featuring the best local ingredients the Acadian Coast has to offer. Indulge in the luxury suits at the Hotel Paulin. Escape to nature at the friendly L’Ancrage B&B, in Saint Louis de Kent. 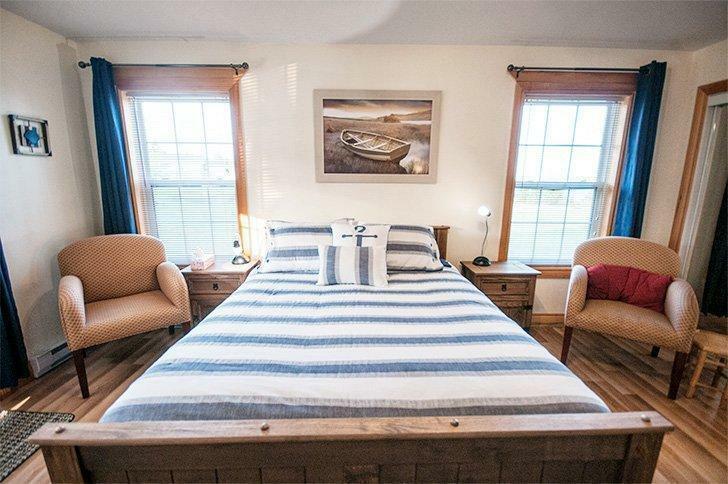 Take advantage of proximity to Kouchibouguac Park while still having luxurious accommodations to come home to at night, at L’Ancrage B&B. Choose from B&B rooms in the main building or opt for your own self-catering cottage. Relax on the terrace overlooking the river and indulge in the hearty home-cooked breakfast. Your friendly Dutch hosts, Liane & Kores, will charm you with their passion for their new home and make your stay an unforgettable one. Get the latest deals on rooms here or book the self-catering cottages here. We hope this taste of the Acadian Coast has whetted your appetite for a New Brunswick adventure. 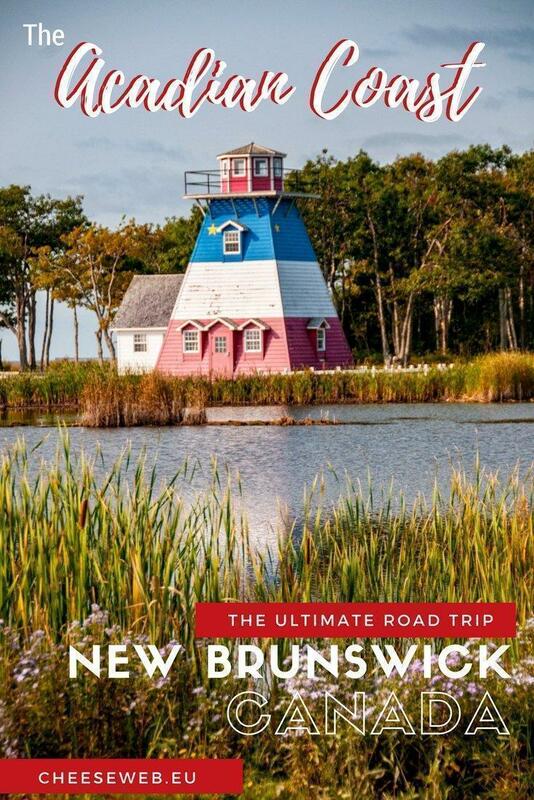 Be sure to check out our New Brunswick Guide for even more travel inspiration in our beautiful province. 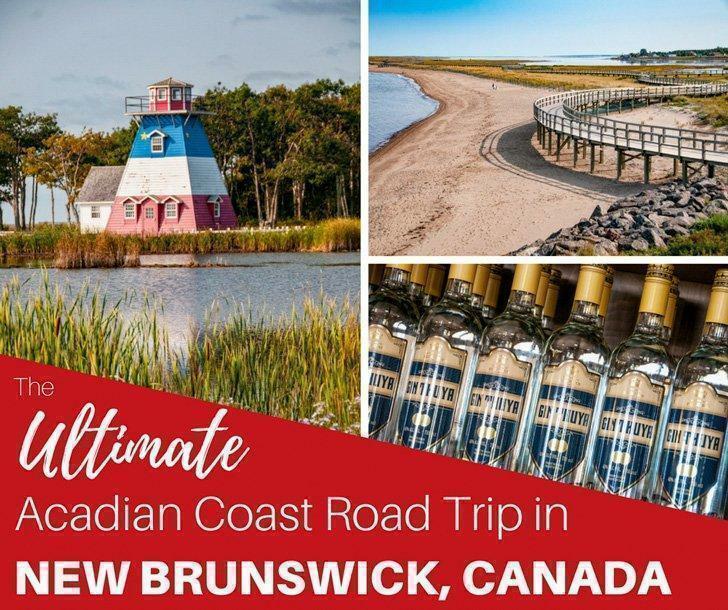 We’d like to thank Anna-Lee at New Brunswick Tourism for helping us discover the Acadian Coastal Route and the businesses that hosted us in the region. As always all opinions are ours alone and we only recommend businesses and attractions we truly love.